Creating personalized experiences with your data is harder than it sounds. Yes, accurately gathering information is important, but what do you do with it afterwards? Keep walking until you're past the 10,000 step goal? According to Lumo co-founder and CEO Monisha Perkash, wearables are arriving at a new stage where data collection is transforming into meaningful data interpretation which is leading to actionable insights. It's certainly not a new concept. But there's different ways to create a system that will tell you what to do next. For Lumo's newest device Lumo Run, it's all about the next steps. Lumo started out with Lumo Lift, a posture correction device that buzzes if you slouch. Perkash says she and her co-founders began with posture because CTO Andrew Chang had back pain. "From day one, my co-founders and I looked at Lumo as a movement intelligence platform where we have always intended to solve a variety of human movement problems." But they knew the platform was going to grow into something more and turned to running. "When the time came to decide what product to launch next, we chose running for a few reasons. It's a personal passion for all of the co-founders. It's a natural evolution of our technology. To go from posture for sitting and standing to running form, it was just a way we could build on our existing science and our existing technology." It's helped that there are plenty of runners as well, with Perkash citing 30 million frequent runners whom she says "love analysis" and are always looking for ways to run better. That's where Lumo Run comes in - a little tracker filled with sensors that doesn't monitor your average fitness tracking metrics. 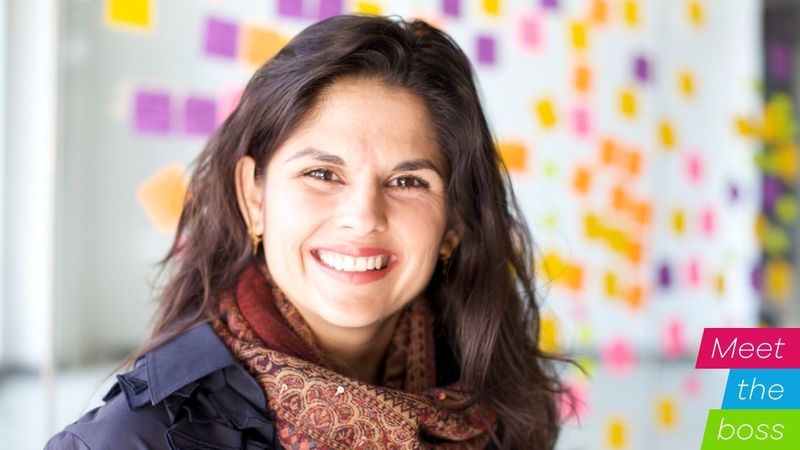 Perkash says she believes Lumo Run is a "leader in wearables 2.0." She goes on to explain that the first round of devices, or "wearables 1.0" are overly focused on steps and activity tracking data. That's fine and dandy, but despite the influx of numbers, wearables haven't been too good on doling out advice on ways to improve anything which Perkash says isn't helpful. Lumo Run on the other hand, gives you the numbers but follows up with a clear, simple set of suggestions. "Data by itself is useless. We have to answer, 'So what?' And that's what Lumo Run does a fantastic job of. Not only does it provide data that isn't seen on any other product - cadence, bounce, braking, pelvic rotation, pelvic drop - we also answer the 'so what.'" "After you go for a run, you'll see the in-depth analysis of the running form, and see specific exercises to target certain muscles to create habits that will improve your form." But creating helpful ways to improve is the hard part especially when it's a constantly evolving process. For the Lumo Run team of engineers and scientists, the work is never done. To be the top 2.0, next gen wearable, it requires a lot of flexibility to change what's not working for users into something that will work. Rebecca Shultz, PhD is product researcher and designer plus biomechanist for Lumo. She notes, "It's an ongoing process, we're always going to change things based on feedback from users." It's marrying algorithms, data science and human science to all create this robust integrated experience. She also says there are two different algorithms working at the same time measuring the runner's metrics. "We have our scientific algorithms in terms of how we measure the different metrics. And then there's the coaching algorithms that help us make sure we're delivering an experience that's creating success for the runner. "It makes sure they're working on things that are going to help their running first and foremost, and building strength and muscles that they need. The two very different types of algorithms are really, really important to for the whole experience." Perkash elaborated by adding in that, "It's marrying algorithms, data science and human science to all create this robust integrated experience." Her notion of 'data alone is useless' is echoed throughout the Lumo team where innovation only happens with data if there's a second part to help users truly understand what's going on. "That's where Rebecca's expertise helps to answer it. (For example) if the target cadence is between 180 and 200 and you're at 160, why is that an issue and what can you do about it? That's how all of the intelligence comes together." You also get audio coaching that specifically focuses on your areas that are most critical - but only if you really want it. And even then, there are various settings for the audio coaching to better personalize the experience. Both Perkash and Shultz believe this is crucial to beneficial habit forming changes where Shultz says perfecting the coaching remains an ongoing process. "I don't know what the final number of iterations for our audio coach are but I want to say it's in the 50s. A lot of testing, user testing and we're still constantly iterating it as we get feedback from users. Finding the line between promoting change and not having them shut it down (the program) is tough." To help encourage runners to keep up with the programs, Lumo has made the app as user friendly as possible. Perkash also emphasized that they've "gone through painstaking measures to make sure it doesn't look data heavy" and that "the experience is informed by your data but it's not cluttered with data." There are still charts and graphs laid out cleanly but you also get a large amount of customization to fit you along with instructional videos and of course, tips on improving cadence, braking, pelvic rotations and more. At the moment, you can clip on Lumo Run with your own pair of running pants or shorts, a new feature from the previous version that only sold the tracker with Lumo's own clothing. You'll also need your phone on you to get audio coaching and GPS tracking, though information can be synced up after a phone-less run (minus GPS routes). It's possible a future generation will incorporate mics and GPS, but it doesn't seem like there are any immediate plans. Along with a rechargeable battery that lasts about 20 hours, the tracker is already packed with 9-axis IMU, accelerometer, gyroscope, magnetometer, barometer, Bluetooth LE and a vibration motor. Shultz did say that there will be third party integration coming along for GPS meaning if you're not running with a phone but are running with a GPS smartwatch or fitness tracker, you'll be able to retain that information. She notes, "We're starting with Strava and then we'll move on from there" and then " Whatever you use to get the GPS data in, and is connected to your Strava account will be available to Lumo." Perkash added that it's a "very natural marriage" between GPS watches and Lumo Run since many runners already wear them. Shultz also says if you Lumo is "complimentary" to other fitness trackers like a Fitbit since they monitor everything else, whereas Lumo tracks metrics very specific to running. So despite designating Lumo Run as a 2.0 wearable, there are still some uses for the 1.0 wearables. Of course, combining the daily metrics with specified metrics and personalized, actionable coaching - a wearable 3.0 perhaps - would be the best of both generations. When asked if it was possible to see something like this from Lumo, Perkash coyly replied, "Absolutely, we will let you know."